When I saw the whimsical dragonfly string lights at Target recently($12.99), I knew I had to find a way to use them this summer. I imagined them more in flight, hovering above some flowers than strung up. I knew they would look best at eye level than high above. 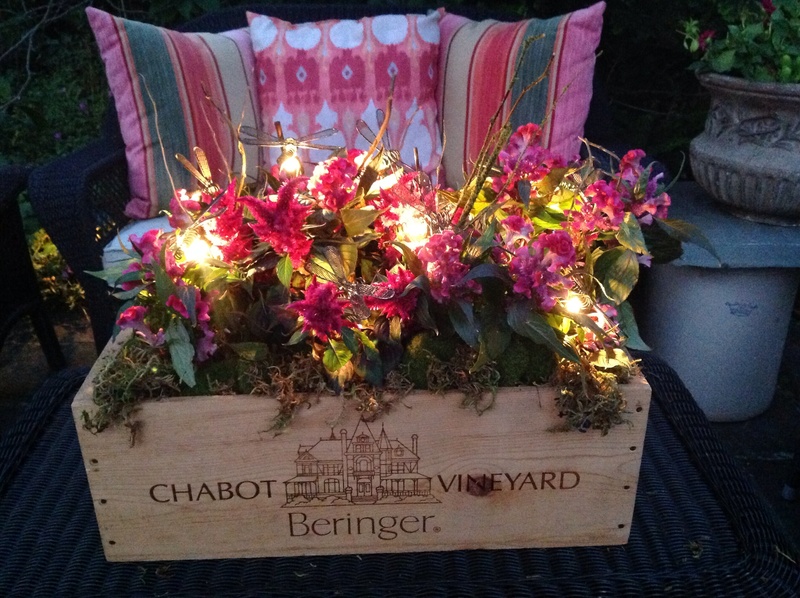 So I created a centerpiece in a rectangular crate that was only 7 inches high. 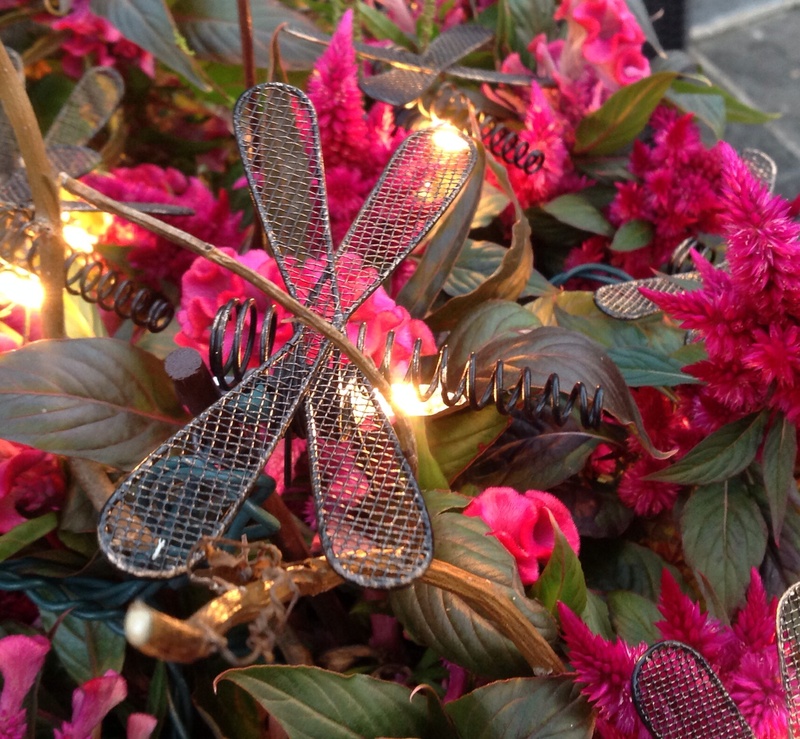 The dragonflies could be admired up close this way and light up the night at a backyard party. In a wooden wine crate I had lined in plastic, I placed 3 pots of celosia plants. I chose these flowers because their blooms are abundant, they flower all summer and have a lot of leaves I could use to conceal the wiring. They are also sturdy flowers that could support the dragonflies without having to use any stakes. 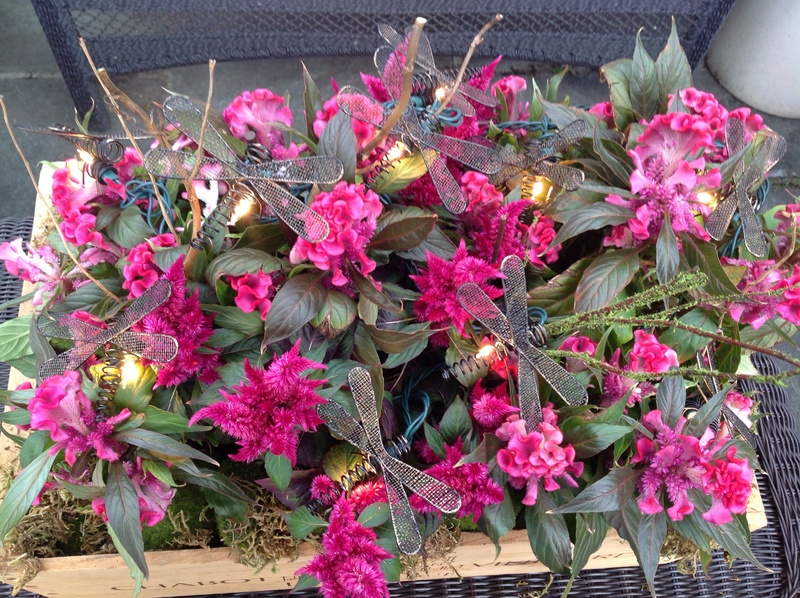 I added a few curly willow branches and some moss covered twigs(Michael’s) to pin a few of the dragonfly lights above the flowers. To secure them I used some floral clips like you find on orchids. While working I connected a dark green extension cord and lit up the string of lights so I could gage the effect. This also ensures the electrical connection will be where you want it when you’re finished. To fill in any gaps around the plants I used florist moss and moss covered styrofoam stones. The final centerpiece is dazzling and whimsical. 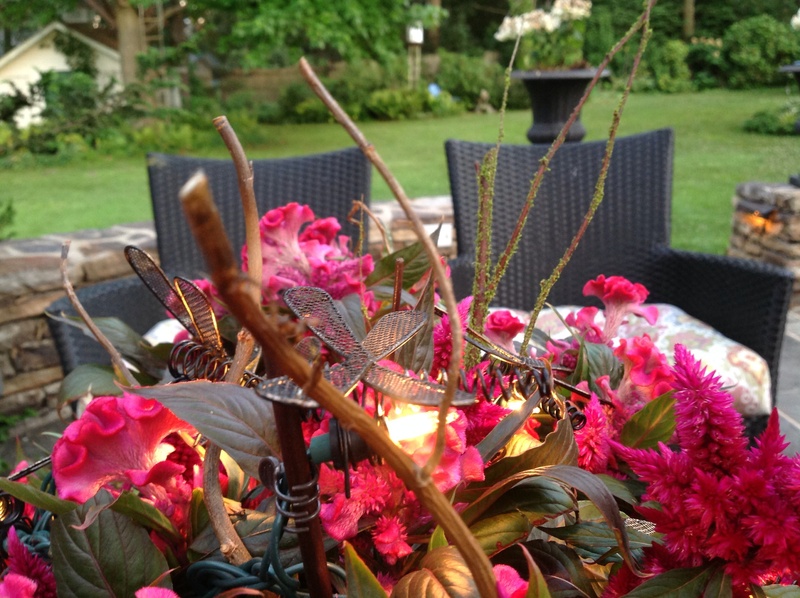 Sure to bring a little magic into any summer fête. 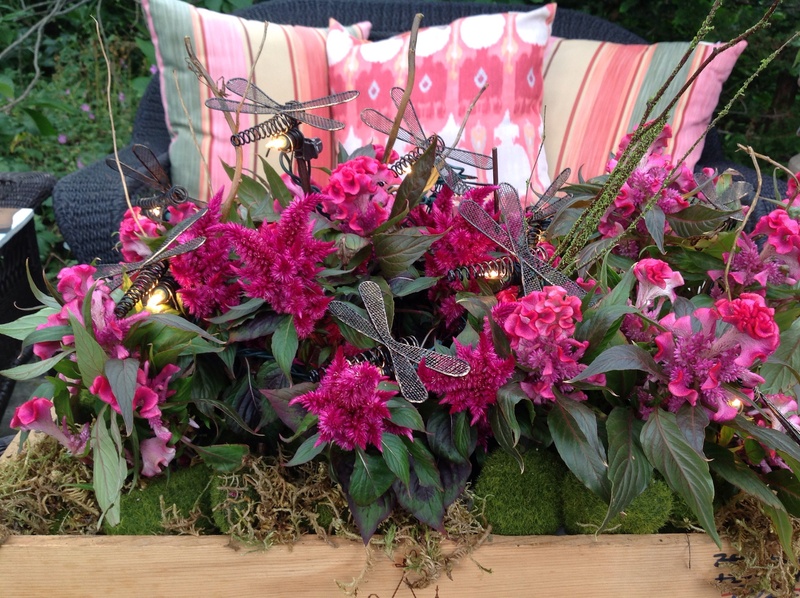 This entry was posted in Crafts, Entertaining, Gardening, Tablescapes and tagged Dragonfly lights in a flower centerpiece, lighting up a floral centerpiece, summer night light up flower centerpiece by Johanne Lamarche. Bookmark the permalink. I saw these lights at Target, but did not buy them and am now mad at myself as they are probably all gone. Are you a florist? You do such fun things with flowers and create such beauty. Thanks Teresa! Just got my lights last week and they had some left at certain stores and online. I just love watching this at nightfall. It is really whimsical. I am a periodontist actually, retired, and retired U Penn assistant professor of periodontics. Just love gardening! When I started to blog I decided to focus on what came naturally to me, cooking and gardening. I try to alternate my writing between the two. Thank you for reading and commenting!